Chocolate and Hazelnuts. Does it get any better? These two just complement each other perfectly, the sweetness and nuttiness are a marriage made in heaven. The fact that this delicious flavour combination is available in the spreadable form of Nutella is, without doubt, better that sliced bread. I remember the first time I tried Nutella, I was about 6 years old and grocery shopping with my Mum when we were offered a small sample (I love free things, especially food, so I never say no to a sample!). Being a chocoholic I had devoured mine within seconds and was instantly hooked, luckily my Mum also has a sweet tooth so it didn’t take much persuading to buy to a jar of the incredible stuff. The rest, as they say, is history – Nutella has been a permanent feature in our cupboard since then and a staple food group of one of my younger sisters, Hannah. I’m sure at one point she lived off of Nutella on toast! As there was no theme for last weekend’s SBC I just couldn’t decide what to bake. Then I remembered some Nutella filled cookies my boyfriend had mentioned (more than once, and pointed out in Starbucks!). I knew immediately that I had to bake these as a little present for him. The result was amazing! 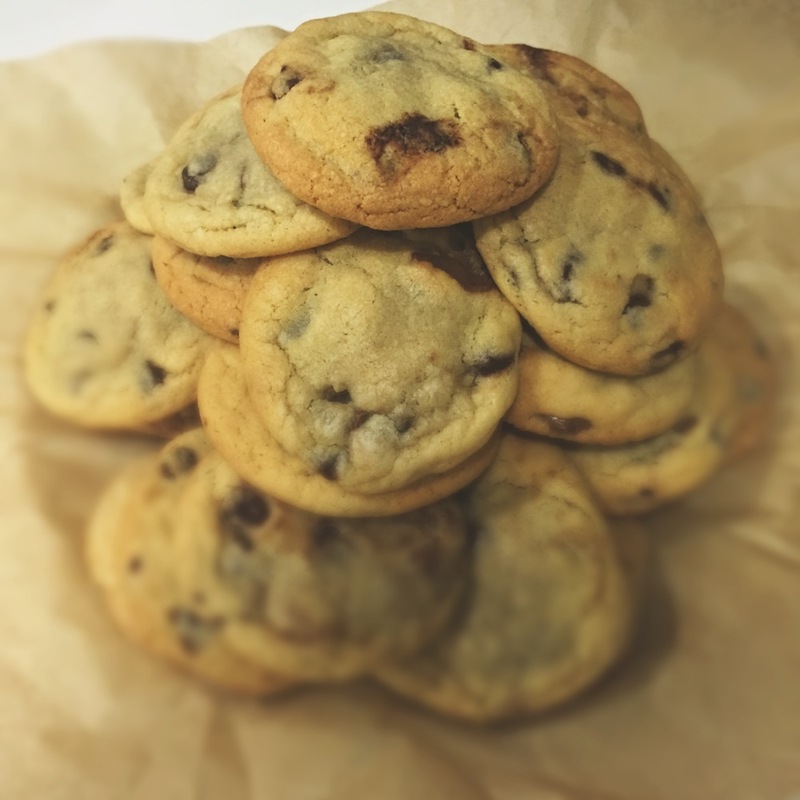 I think they have to be the best cookies I have ever eaten and the recipe is another that is pretty quick, easy and doesn’t require anything you probably don’t have in your cupboards. 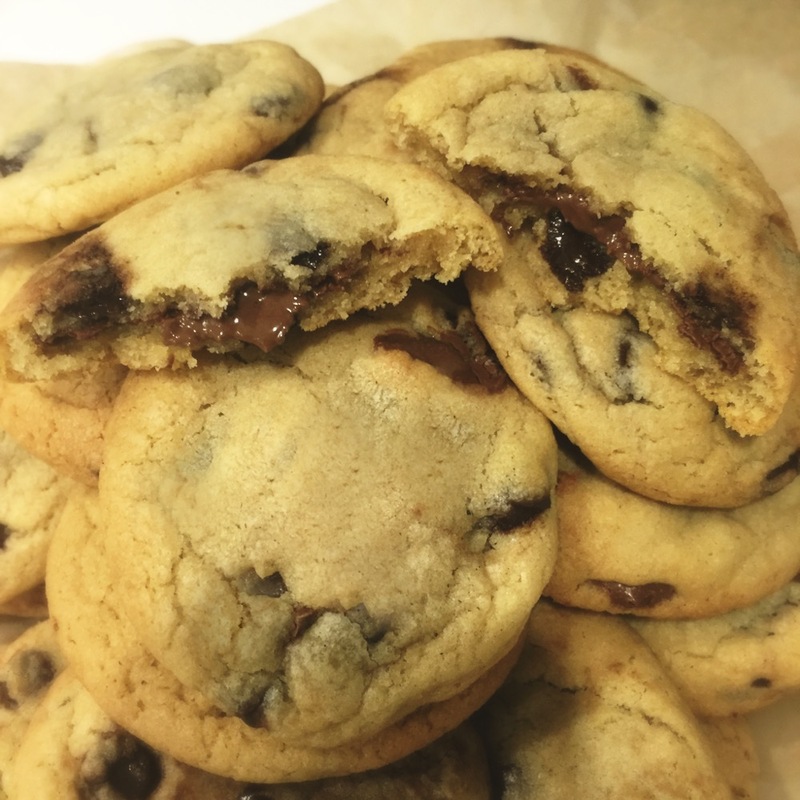 The cookies are soft and chewy and have a wonderful gooey Nutella centre. Alex was extremely happy with this and has polished off about 20 in the past week, luckily for him (and rather enviously for me!) he has an incredibly fast metabolism and the 4 cookies he has been consuming each day won’t have made the slightest difference to his waistline. The recipe I used made a whopping 32 cookies so fortunately I managed to sneak a couple without his knowledge 😉 It also meant that there was a little bit of room for error which was helpful as I slightly over-baked the first batch I cooked. Forgetting that the cookies would continue to cook once I had removed them from the oven, I thought they looked too soft after 10 minutes so left them in a little longer. This resulted in a more crunchy cookie without a gooey filling. Still delicious though! I urge anyone who likes Nutella in the slightest to try these, you will not be disappointed! 1. Preheat the oven to 180C/160C fan/Gas mark 4 and line a couple of baking trays with baking paper. (I needed 4 trays but only have 2 so had to make 2 batches). 2. Using an electric stand mixer cream the butter and both sugars together until light and fluffy. Add the eggs one at a time and then the vanilla, mixing well after each addition. 3. 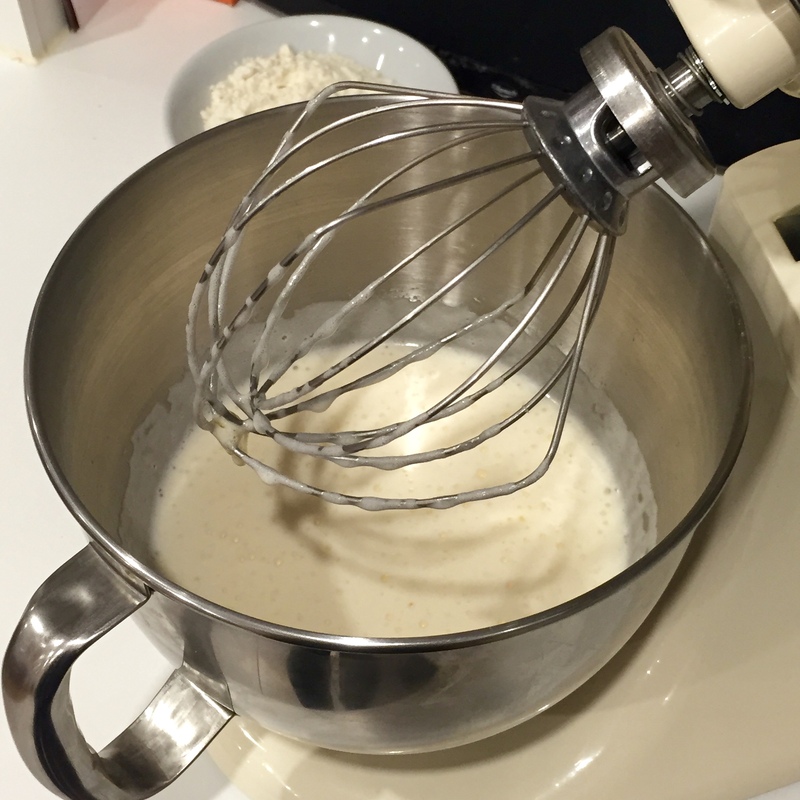 Turn the mixer down to a slow speed and add the flour, salt and bicarbonate of soda mixing until just incorporated. Finally, add the chocolate chips. 4. Using a heaped tablespoon create balls of dough. Place each ball in your hand and flatten well. Place a teaspoon of Nutella in the centre of the dough and then fold over and pinch together the edges of the dough shaping it around the Nutella. 5. Place on baking trays and bake for about 10 minutes, until lightly golden. The cookies may not look fully cooked after 10 minutes but they will continue to firm up whilst remaining chewy after removing from the oven. Before I visited Florida I didn’t like pancakes. Everyone thought I was crazy but I just couldn’t get my head around putting lemon and sugar or chocolate spread on something made with the same batter as Yorkshire Puddings. Yuck! This all changed whilst I was on holiday. As you may know/have seen on TV, pancakes are a major breakfast staple across the pond. Almost every meal, on every menu, in every establishment I visited came with a side order of pancakes. Everyday our breakfast table would be covered with stacks of them – golden, fluffy and smothered in butter and maple syrup. Nothing like the crepe style pancakes I’m used to seeing at home on Shrove Tuesday. When my boyfriend suggested I try one I was pleasantly surprised at how delicious they were! I was even more pleasantly surprised to find ‘Banana Pecan Pancakes’ on the menu and in the healthy section (albeit “healthy” in American Diners tends to means around a whopping 750 or so calories (which may explain the muffin top I now have!)). The contrast between the fluffy pancake and the crunchy nuts scattered throughout just added to the deliciousness of them. Upon discovering that the theme for last week’s SBC was ‘Favourite Pancake Topping’, I immediately knew my bake had to be banana and pecan flavoured. I did a little research and found a recipe online for banana and pecan nut muffins. As any baking fanatic will know, Mary Berry, the queen of baking, ALWAYS says to read the recipe twice. We all know this. Did I remember this key point before baking these muffins? No, I forgot. I did think a tablespoon and a half of salt was quite a lot for a standard 12 muffin mix but I pushed the doubt from my mind and continued with the recipe. It wasn’t until I was about halfway through that I took another look at the recipe and realised my error. My boyfriend (an armchair baker at most) took great pleasure in reminding me of Mary’s motto. Luckily, I realised before I had combined the wet and dry ingredients and I had enough spare flour so all was not lost. They ended up turning out really well, not too dissimilar from the pancakes I’d tried Stateside and I have received a lot of good feedback on them since which is always a nice feeling! Preheat the oven to 190C/170c fan/Gas mark 5 and lightly butter 2 muffin tins or line with muffin cases. In a large bowl combine the flour, baking soda and salt and set aside. In a separate bowl mash 2 of the bananas well but leaving a bit of texture (kind of like lumpy baby food). In a freestanding electric mixer, using a whisk attachment, whisk together the remaining bananas and the sugar on a high speed for about 3 minutes. Add the melted butter, eggs and vanilla and beat well ensuring you scrape any unmixed ingredients from the sides of the bowl. Fold in the dry ingredients until just incorporated and then the same with the mashed bananas and chopped nuts until evenly distributed. Spoon the batter into the muffin tins/cases filling until about half full. Give the tins a rap on the counter to get any air bubbles out. 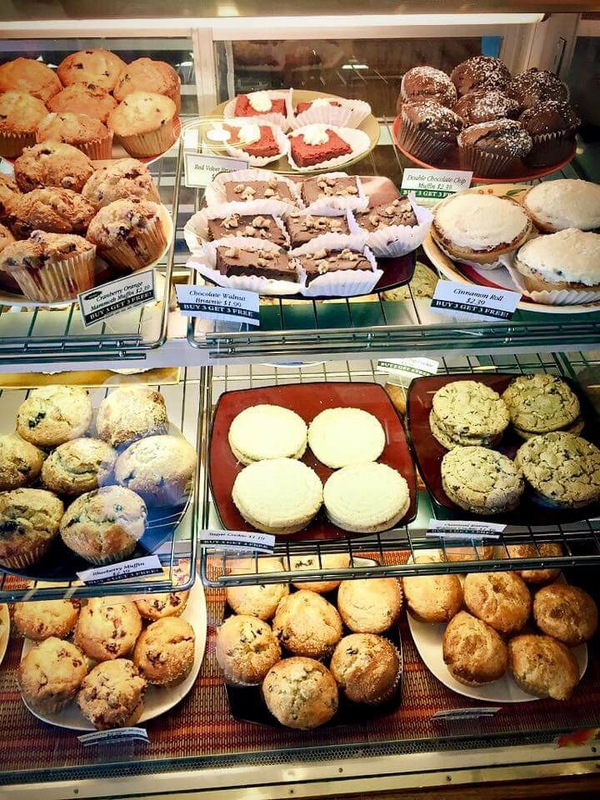 Bake in the oven for around 18-20 minutes, until a knife stuck in the middle of the muffin comes out clean. Leave to cool for a few minutes before devouring. I’m sorry I pretty much disappeared from here! I got back from my holiday to Florida the Sunday before last and life has been pretty hectic since as my boyfriend and I are currently looking at buying a flat. I did manage to squeeze in some baking last weekend but I just haven’t had a chance to write about it. Florida was amazing! It was my first trip to America and I loved every minute of it, I can’t wait to go back. I think I must have put on about a stone as the food is amazing and the portion sizes are massive. I was having pancakes and chocolate peanut butter muffins for breakfast every day and would top that up with a further 6(!) (buy 3 get 3 free) to takeaway. Definitely appropriately named “mammoth” muffins that were the size of my hand and filled with gooey peanut butter…mmmm! They were amazing. I need to find a recipe to recreate them! 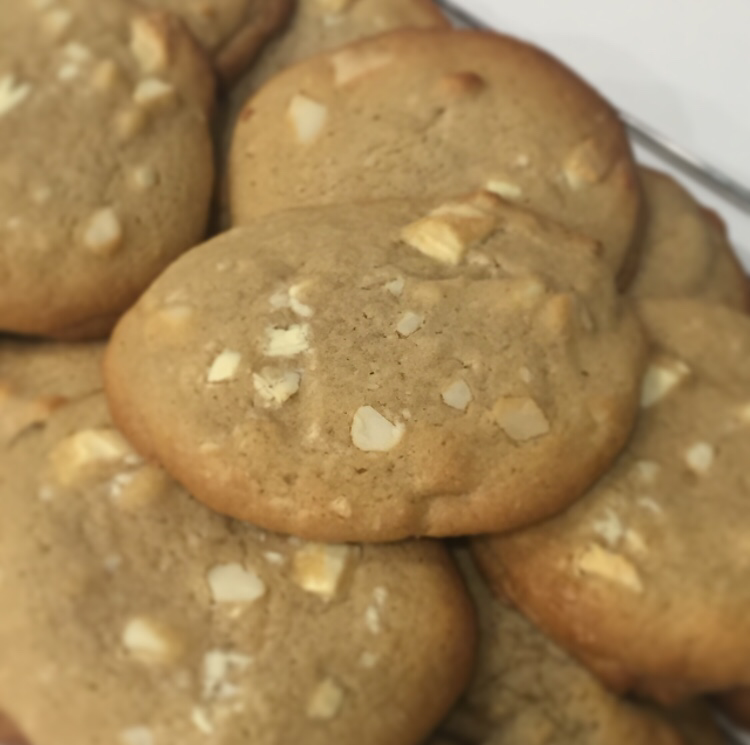 Whilst we were away my boyfriend introduced me to white chocolate and macadamia nut cookies. Albeit only from Subway they were delicious nonetheless. They were the perfect cookies, soft and chewy, indulgent, deeply satisfying and extremely moreish! What more could you want!? As last weekend was Valentine’s day the theme for SBC was to bake something you love but I have been trying to be good since overindulging in Florida so instead I decided to bake something for the one I love and he chose these. I used a recipe I found in the Hummingbird Bakery Cookbook and just substituted pecans for macadamia nuts. The recipe is really simple and most of the ingredients I already had in my cupboard. They didn’t take very long to prepare nor did they create much washing up which is always a bonus and makes them taste just that extra bit more delicious! 1. Using a freestanding electric mixer with a paddle attachment (or use an electric handheld whisk) cream together the butter and sugars until light and fluffy. 2. Add the eggs one at a time and mix on a medium speed until combined. Scrape down the side sides of the bowl to incorporate any unmixed ingredients. Turn the mixer down to a slow speed and beat in the vanilla extract. 3. Add the flour, salt and baking powder and mix well until a smooth dough is formed. Stir in the chocolate and macadamia nuts until evenly incorporated. 4. Divide the dough in half and place each half onto a separate piece of cling film. Then shape each half into 2 equal rolls measuring 15-18cm in length and wrap the roll in the cling film. (My dough was quite sticky so this was pretty messy!) Place the rolls into the freezer to set for a couple of hours. 6. Remove the cling film and slice the rolls into discs about 2-3cm thick. Place the discs onto the baking trays ensuring they are evenly spaced out to allow for spreading whilst baking. Truth be told I’ve always been indifferent to caramel, it’s a nice flavour but not one that has ever particularly excited me and therefore I have never been inspired to incorporate it into my baking. As a result, when I discovered last week’s theme for the Sunday Baking Club was caramel, I wasn’t feeling overly enthused. That was until I discovered a recipe for a chocolate and caramel ombre cake! Any recipe that includes chocolate is a winner in my books and eager to use the Wilton’s Easy Layer Cake Pan Set I got for Christmas this was the perfect opportunity to test it out. This would be a great cake to make for a celebration as ombre cakes look so impressive and are fairly simple to make. I had to alter the recipe slightly from the one I found on the BBC Good Food website as the Wilton layer cake tins are much smaller than a standard cake tin so if you wanted to make this using a larger tin the recipe would have to be doubled and the cakes would need to be cooked for around 20-25 minutes. The cake is really easy to make, the batter is made in two batches, a vanilla batter and a caramel batter, each of these are then separated and cocoa powder is added to half creating the chocolate and caramel chocolate layers. The moist, spongy layers of cake are then sandwiched together with a creamy salted caramel frosting and the entire cake is covered with rich, fudgy, chocolate ganache. Unfortunately I am detoxing before my holiday to Florida next week so will not allow myself to have any, however my boyfriend/chief taster/washer upper (who claims he doesn’t like cake!) was very impressed with the overall result and has assured me that it tastes even better than it looks. Preheat the oven to 180C/160C fan/Gas mark 4 and grease your cake tins. For the chocolate and vanilla layers combine all ingredients, apart from the cocoa powder, in a large bowl. Mix together using an electric mixer on a medium speed until all the ingredients have combined to form a smooth batter. Scrape half of the batter into one of the tins. Then add the cocoa powder to the remaining batter, mix until fully incorporated and then scrape into another cake tin. For the caramel and caramel-chocolate layers repeat step two, again leaving the cocoa power out, halving the batter and mixing the cocoa powder into one half. Place all of the tins into the oven and bake for around 18 minutes or until a skewer poked into the centre of the cake comes out clean. Whilst the cakes are in the oven make the chocolate ganache. Place the chopped chocolate in a large heat proof bowl. Heat the cream in a small saucepan over a medium heat until it is simmering, do not let it boil. Remove the pan from the heat and pour over the chopped chocolate, leave for about 5 minutes for the chocolate to soften. After 5 minutes start mixing the chocolate and cream together and stir until all the chocolate has melted. 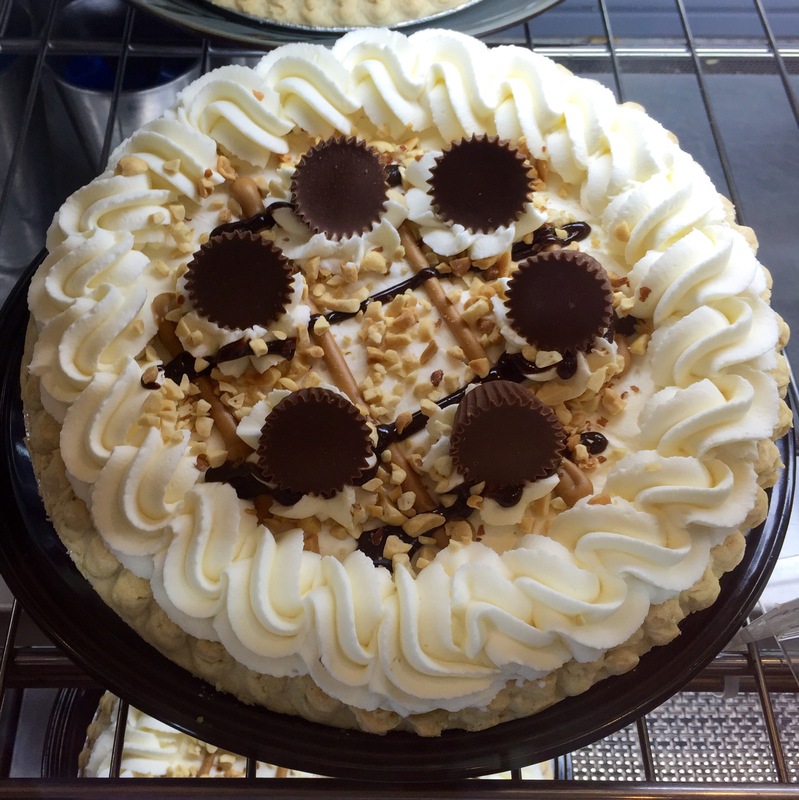 Chill the ganache in the fridge so it firms up. Once the cakes have finished cooking place onto a cooling rack. Next make the salted caramel frosting. Using an electric mixer beat the icing sugar and butter together on a medium speed until the mixture comes together and is well mixed. Then add the milk and salted caramel flavouring mixing on a high speed. Continue mixing for about 5 minutes until the frosting is light and fluffy. Once the sponges are cool spread a third of the frosting over the chocolate sponge and top with the caramel chocolate sponge. Spread over another third of the frosting and top with the Caramel sponge, then the final third of frosting and top with the vanilla sponge. 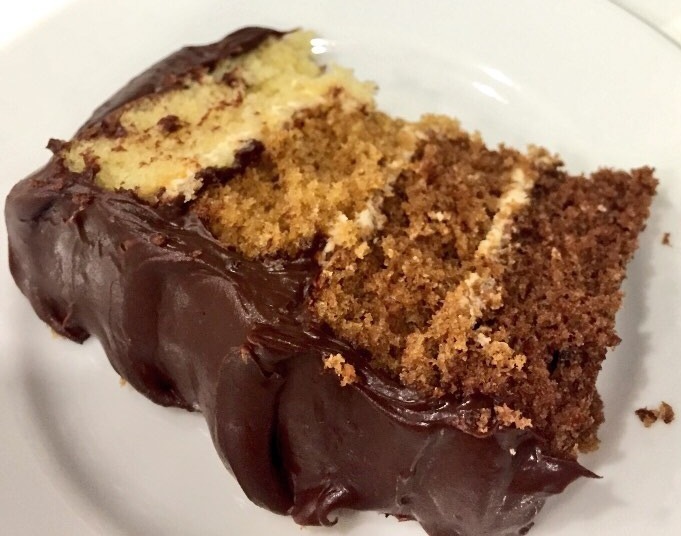 Finally, cover the cake with the chocolate ganache. The weekend I made my first bake for the Sunday Baking Club. When I found out that this week’s technical challenge was a Swiss roll I was so excited! 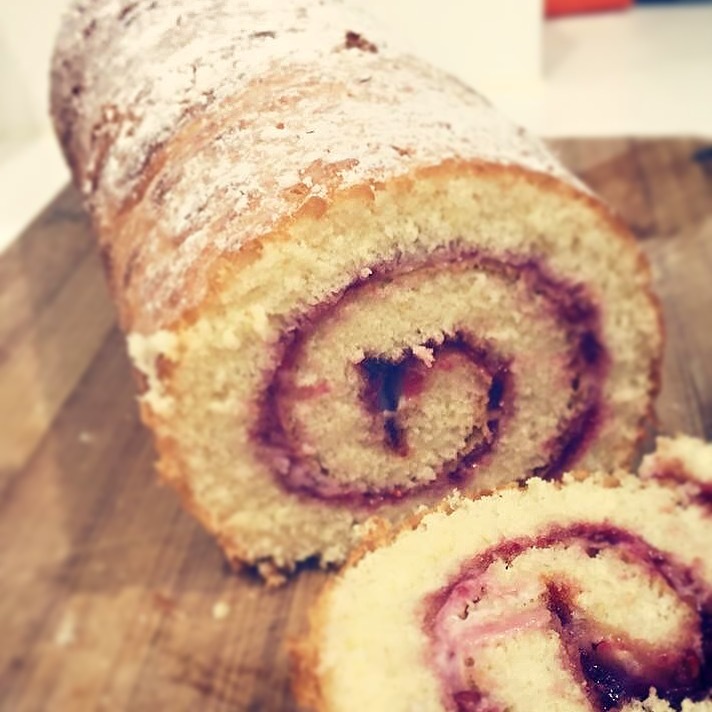 I last made a Swiss roll 10 years ago, during a school cookery lesson, when I was 13. I seem to remember the lesson being pretty easy and getting a good outcome, so I thought to myself ‘what a nice easy challenge for my first week with the baking club and first blog post, how hard can it be?’, I couldn’t have been more wrong! I did a Google search for a Mary Berry recipe hoping it would ensure a fail-safe bake and was pleasantly surprised to see how simple the recipe was, only requiring 4 ingredients and 10 minutes of baking time! I was feeling very confident at this point and already had images of my perfectly rolled, golden, spongy Swiss roll in my head. Ha! I preheated the oven, prepared my tray and got baking. I started by beating together the eggs and sugar until they were combined, I did this for a couple of minutes, folded in the flour and then stuck it in the oven. 10 minutes later I had a flat, rubbery oblong that smelt distinctly of scrambled eggs! I was devastated, it was meant to be perfect and I could just imagine the disappointed looks from Mary and Paul (when I bake I genuinely believe I’m a contestant on GBBO!) . After a couple of hours of wallowing in self pity I did some research and discovered the eggs and sugar probably needed to be whisked for much longer so I decided to try again. The result…another flat rubbery failure! It turns out the flour I had been using had a best before date of Sept ’13!! I was relieved to find out it wasn’t my technique. Determined not to let the Swiss roll defeat me I ventured out into the rain and cold that evening to buy a fresh packet of self raising flour. It was worth it in the end as the final result was the golden, light sponge I had hoped for. Plus a filling of your choice, I kept it simple with a classic jam filling this time. 1. Preheat your oven to 220°C/Fan 200°C/Gas mark 7. Grease a 13 x 9 inch Swiss roll tin and line with baking paper. 3. Sieve half the flour into the bowl and carefully fold into the mixture. Repeat this step using the rest of the flour. Then carefully fold in the tbsp of warm water, this helps the mixture to spread when poured into the tin. 4. Pour the mixture into the tin spreading evenly and bake in the oven for around 10 minutes, until it’s lightly browned and starting to come away from the edges of the tin. 5. Place some baking paper onto a work surface and lightly sprinkle with caster sugar, upend the sponge from the tin, place onto the paper and peel away the baking paper. Whilst the sponge is still warm, lightly score it at the end closest to you about 2cm away from the edge, cover the sponge with a tea towel or piece of greaseproof paper and starting at the scored end roll the sponge away from you. Leave the sponge to cool like this. (Rolling the sponge whilst it is still warm and before filling ensures it remembers the shape it is meant to be, covering it with a tea towel or greaseproof paper stops the sponge from sticking to itself).